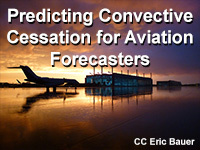 This module introduces aviation forecasters to a conceptual framework for analyzing, diagnosing and predicting convective cessation and resulting conditions near airports. Users will first learn about five main environments with respect to convection, and three patterns in which these environments are commonly arranged. Next, users are immersed into an adjustable-time case simulator to practice applying the convective environment frameworks to their forecast process, while periodically amending TAFs and responding to warning, storm report and caller interruptions. Finally, a case summary ties together convective environment discussions with verification of the event. I felt this lesson a bit too difficult. It might be better if the usefulness and limitation of a forecast model output should be stated more clearly. I also needed more instruction how our mental model such as meso high can be supported or modified by updated observational data. One of the questions had repetitive answers (lines in a TAF), nobody would send a TAF out like that. Wound up losing points on it due to question error. Since this lesson is practical, you may need some more time than expected. Course does a good job covering the basics of issuing TAFs for MCS events. Suggested improvement would be to make the Louisville Case Study more interactive and fluid and remove the questions at the bottom of each page that distract the student from the actual TAF writing. An important aspect of terminal forecasting that is often overlooked is covered well in this lesson - the post-thunderstorm environment, including winds, ceilings and visibility - at an airport after a thunderstorm encounter. This is frequently not handled well in a forecast and can cause traffic management issues at a major terminal. I really like the conceptual models, and the simulation feel to the case study portion.